This is the first story in Season 17. Romanadvoratrelundar (or Romana for short) is a Time Lady. In The Ribos Operation, the White Guardian transported her onto the Doctor's TARDIS to help him in his quest for the Key to Time. This story starts with her regenerating into a new incarnation. We do not know why she has regenerated. The Daleks are a race of evil mutants encased in powerful cyborg bodies whose shape is reminiscent of pepperpots. The Doctor has fought them many times, first encountering them on in a city on their home planet of Skaro in The Daleks. During that story their home planet was highly radioactive. In Genesis of the Daleks, the Time Lords sent the Doctor to the point when the Daleks were first created with a mission to either stop their creation or find a weakness. He believed he had done so when he entombed them within the bunker they had been based in, thinking that he had set their development back a thousand years. 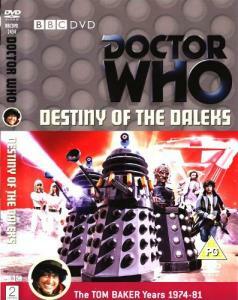 The Doctor considers the Daleks his greatest enemy and they are a serious threat to anyone they encounter. Davros is the scientist who created the Daleks. In Genesis of the Daleks he foresaw how his race, the Kaleds, would evolve as a result of the radioactive damage their war with the Thals would cause. He engineered this mutated form, altering their emotions to feel hatred for anything that wasn't like them. He also put them into Mark 2 travel machines, which were the earliest form of the Daleks' exterior casing. At the end of that story, Davros was thought to have been exterminated by his own creations. In Genesis of the Daleks, the Doctor buried the bunker where the original Daleks were created. He also encountered Davros, who he believes to have been exterminated by his own creations.